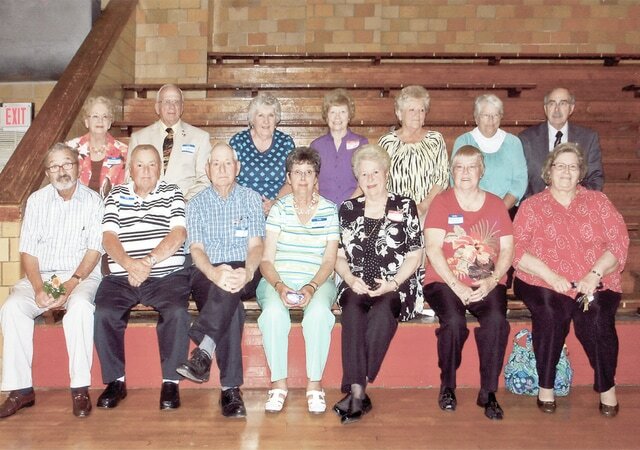 The Edison Alumni classes of 1950, 1955 and 1960 were celebrated at the Edison gym on May 23, 2015. Greeters were Sonny (1954) and Marilyn Harper Burnside (1958) and Ray and Sandy Harper (1957). President Jim Osborn (1950) welcomes everyone and Cody Bedwell (1957) gave the invocation. A baked steak dinner was catered by Mt. Gilead Cornerstone Cafe for 64 alumni and guests. After dinner, the program was the “History of Edison,’ presented by Stan Sipes. Almost everyone learned something new. It was very enjoyable. Paul Darling (1959) led the Pledge of Allegiance, and Twila McClarren Gist (1949) gave the memoriam. Jim Osborn read a tribute for the military, “Honoring American Heroes,” by Rebecca Weber. Ten military graduates were present. Mt. Gilead Schools Supt. Jeff Thompson an Karen Seckel from the Tomorrow Center talked about the Edison building and what would happen if the Tomorrow Center moves to Cardington. Jim Osborn called the business meeting to order.The slate of officers for 2016 were read: President Floyd Hawk (1955), Vice President Charlene Ireland Fliger (1955), Secretary Barbara Siegfried Darling (1959) and Treasurer Harold Alfred Wren (1960); trustees Walter Benson (1960), Karen Crum Benson (1960), Paul Darling (1959) and Billie Powell Pangborn (1960). Motions were made and all were elected. Charlene Ireland Fliger (1955) was theh toastmistress for the rest of the evening. She entertained everyone with jokes and stories of some of the alumni. Honored classes were acknowledged: 1940 – no representatives; 1945 – Neil Wright; 1950 – Donan Hawk Osborn and James Osborn; 1955 – Phylis Bush Miller, Floyd Hawk, June Noble Hawk, Charlene Ireland Fliger, Bill Jones and Richard McPeek; and the last graduation class, 1960, had Walter Benson, Karen Crum Benson, Diane Cox Lemley, Billie Powell Pangborn, Martha Conant Jones and Sharon Stillings Wilson. The oldest female graduate was Martha Myers LEe (1938) and Merril Woods (1948). Honore for travelling the farthest was Sonny and Marilyn Burnside. The family with the most alumni present was the Harper family. The next banquet will be held May 28, 2016 with Floyd Hawk serving as President. The location is not known at this time.